Did it diverge from them? Or was it the result of crossbreeding between them? Or crossbreeding with an entirely different breed no-one is entirely sure. There were 29 herds listed in the first herd book with 15 Boars and 62 Sows. Sadly some of the bloodlines have been lost, but today’s dedicated and enthusiastic breeders are determined to save the remaining lines. The current picture is very encouraging with the rarest bloodlines hanging on and slowly increasing. Hopefully the Breed is at last safe (although still relatively few in number) Recognition by, and transfer of herd book management to the BPA from the Oxford Sandy and Black Society has already brought the hoped for benefits of increased publicity and opportunity to compete in the shop window of BPA recognised shows. The ground colour should be a light sandy to rust with random black blotches (not spots) with a white blaze, feet and tassel. A medium to large pig with good length and a deep body, good quarters and fine shoulders, strong legs and feet and well set on, giving a free and active gait. A moderately strong head, straight or slightly dished with lop or semi lop ears. 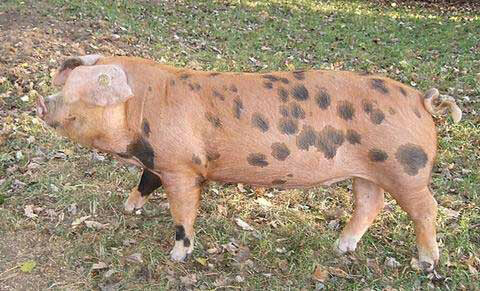 Producer’s of fine quality white skinned pork and bacon with superb flavour – will finish to pork weight in 22 weeks.